Download Your Free Guide on How to Paint Flowers Today! Sketching flowers is one of the most rewarding ways to hone your artistic skills of drawing while contemplating the beauty of nature. You can take your “studio” outdoors and draw flowers to your heart’s content using nature itself as your model or you can work from photographs of flowers, sketch artificial flowers, or create a still-life flower drawing set-ups that bring nature indoors. If you love this idea as much as we do, then you will love our FREE eBook on how to draw flowers. With these free drawing exercises, you’ll be all set to take on any flower drawing that you choose. First, you’ll find an extensive section on getting started, with informative information on what medium to use, from colored pencils to oil pencils and water-soluble colored pencils, what kind of surface will suit your flower drawing and why, and what tools you may need along the way to creating your rose drawing or any other flower drawing you want to sketch. Plus, you’ll also find an extensive master color list for the illustrations in the eBook, so that you can pinpoint the colors you see in each step-by-step chapter. From there, you’ll find six specialized flower drawing chapters, one for each popular flower that you will discover how to sketch. Azaleas, Gerbera daisies, hydrangeas, water lilies, magnolia blossoms, and how to sketch a rose—they are all in this fresh and colorful eBook on how to draw flowers! Learning to Draw: One Drawing Technique at a Time! Plus, along with this free flower drawing eBook you’ll also receive a free membership to our Artists Network community. This membership provides you with access to our free techniques, blogs, and newsletter; plus you’ll gain the help and support of thousands of artists of all abilities. First, you’ll find an extensive section on getting started, with informative information on what medium to use, from colored pencils to oil pencils and water-soluble colored pencils, what kind of surface will suit your flower drawing and why, and what tools you may need along the way to creating your rose drawing or any other flower drawing you want to sketch. 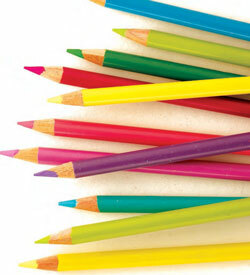 Water-soluble pencils are usually drier and harder than wax or oil pencils. They don’t lend themselves as well to heavy applications of pigment used in techniques such as burnishing. Oil-based colored pencils work like their wax counterparts and mix easily with them. Also included in this free art lesson is an extensive master color list for the illustrations in the eBook, so that you can pinpoint the colors you see in each step-by-step chapter and see how you can vary colors according to your own preferences. Refer to a customized color palette for each flower drawing mini-chapter, so that you can match your progress with what you see in the eBook. From there, you’ll find six specialized flower drawing chapters, one for each popular flower that you will discover sketching techniques in this eBook. Azaleas, Gerbera daisies, hydrangeas, water lilies, magnolia blossoms, and how to sketch a rose. Each mini-chapter unfolds with step-by-step instructions on how to draw flowers just as you see them and, what’s more, you’ll also find that the chapters have several visuals that will show you the transition from the first sketch to finished flower drawing. What’s most exciting about learning how to draw roses or any other flower is that when you draw flowers you are harnessing nature’s beauty with your art. It’s an incredible way to show your appreciation of the natural beauty you may find around you and you get to learn to draw flowers in the process. Learn how to draw flowers today with this FREE guide! If you’ve ever wanted to learn about drawing a rose or creating a flower drawing that you could give as a gift, this guide will put the skills you need in your hand. The step-by-step instruction makes drawing flowers a cinch, and you’ll be amazed at the lovely results you’ll get with each stroke of your colored pencil. Learn how to sketch flowers in easy steps: click, download, draw! Are you getting excited about the myriad ways you can use a flower drawing in your art? As a subject matter in and of itself, drawing flowers can be incredibly rewarding. It’s a refined and sophisticated way of creating flower drawing art that goes back centuries. But you can also decide how to sketch flowers in new ways. Basically, you can take the flower-drawing instruction that you learn and use it in any way you want.